Nymindegab had a test site until 1943. Two interesting bunkers were a Jägerstand (like the ones built on the Channel Islands) and a so-called Gogarten-Stand, with a 12cm thick armoured turret for a field gun. 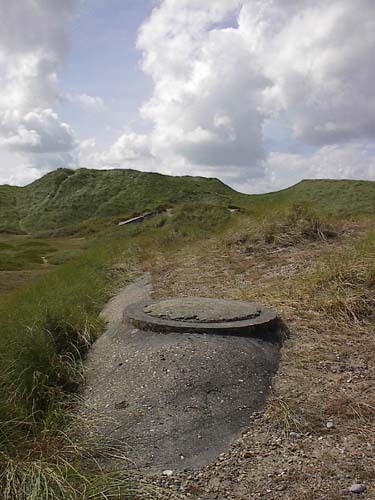 Unfortunately they are covered beneath huge dunes, together with the big part of the army coastal battery. More inland, at the Nymindegab Home Guard base, is the core of the Infanterie Stützpunkt with some very interesting bunkers. A covered bunker of the coastal battery.